Eric Overbey, of Springfield, Missouri, shared a story his teacher told him when he was a student in Roswell. The teacher, a competitive fisherman, was driving through Mississippi on his way to a tournament when a police officer pulled him over for driving with a broken taillight. The officer asked for his license and registration, and he complied. The officer then asked for his green card. “I don’t have one,” he said, confused. The trooper told him to exit the vehicle and proceeded to arrest him. When he asked what he was being arrested for, the officer said, “For illegal immigration. You will be deported.” Despite every attempt to explain to the officer that New Mexico is a state and that he was a citizen in good standing, he still spent the night in jail. 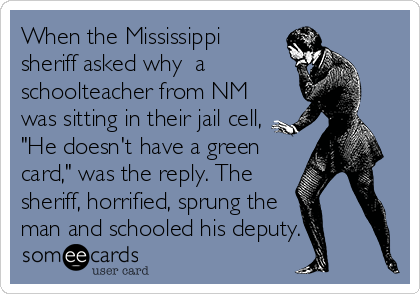 When the sheriff of that county arrived at the jail the next morning, he asked what the teacher was in for. The deputy explained that his prisoner was from New Mexico and that he did not have a green card. The sheriff then schooled his officer in New Mexico’s status as part of the U.S.A. When Mauro Montoya Jr., of Albuquerque, was a senior at New Mexico State University, he spent a semester at Towson State College (now University), in Baltimore, Maryland. During one of Montoya’s first days at Towson, a professor asked each student where he or she was from. “New Mexico,” Montoya responded. After class, the professor took Montoya aside and told him he was impressed that he’d come all the way to Baltimore. “Your English is excellent! How do you like the American schools so far?” Montoya writes that, “I looked at him somewhat incredulously, but then responded, ‘I like them well so far, but their geography classes must be lacking!’” The teacher looked puzzled, until Montoya pointed out that New Mexico is the U.S. state between Texas and Arizona, just below Colorado, and that it shares an international border with the nation of Mexico. “He had the grace to be rather embarrassed,” says Montoya. Although Tom Mullen now lives and works in Pakistan, where he works as a consulting civil engineer, in the 1990s he and his parents lived in Albuquerque. He recalls, “My mother once sent her income-tax statements to a prestigious firm so they could prepare her return. When they had not sent her back the paperwork to approve within a time she considered reasonable, she grew worried and phoned them.” The mystery was solved when it came to light that they had sent the envelope to her in Albuquerque, Mexico. Fortunately, it had been returned to their address via Mexico’s postal system. Dear “50” fans: Help sustain this popular feature by sharing your anecdotes—we know you have some choice ones that you haven’t gotten around to sending in. Just dash it off if you like, and we’ll take it from there. Submissions will be edited for style and space. Please include your name, hometown, and state. 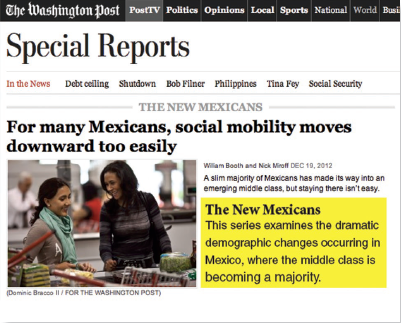 E-mail to fifty@nmmagazine.com, or mail to Fifty, New Mexico Magazine, 495 Old Santa Fe Trail, Santa Fe, NM 87501.